I have a trio of 7 yr old rex sisters and I added a 2yr old male nethie (and a female mini lop but she fell out with Jet, one of rexes so I took her out). They live in an enclosure in a shed, of 8x4ft with an attached enclosed aviary run of 3x6ft with a tunnel to a 6x 8 ft run. So total of 98ft sq? My other trio, currently being bonded is 2 males and a female, all non related. I bonded Dave and Lucy and now a professional bonder is adding in my new male. They’ll have a 6ft x3 ft double hutch plus aviary of 8ft by 6ft, so total of 84ft sq. Both set ups have a runaround tunnel attached to a run on the grass but this is not open all the time. Only when I’m home due to digging out issues! I have a quad. Two bucks who fell out just after being neutered and two does from a rescue (thank you barc). The bucks were kept apart for a few weeks to forget about the falling out then reintroduced with the does added in. I did the bond in October, a less hormonal time of year. It went well and they have been happy ever since. They have always had at least 10 x 6 feet of space. Currently a shed and run. Last edited by tulsi; 15-04-2018 at 09:35 PM. I've got a quad of FFMM they are mum, dad, daughter and son. I don't know square footage but they have double hutches in a big U around the room with 7FT, 6FT, 5FT, 5FT joined with all the sides off so they can run the full length all through the hutches, go up the damp and run through them all up there. Plus they have 24hr access to the space outside the U of hutches. A quad FFFF mum and 3 daughters who have a 7FT x 6FT shed over 3 levels with 7FT x 6FT aviary. Trio FMM the two males are litter mates who have 5FT x 6FT shed with upper levels and 7FT x 6FT aviary. Bleu currently has all downstairs and fleur has all upstairs but hopefully the bonding works and they will have the full house apart from the indoor quads room. My one trio with 2 females and one male did work eventually but the bonding was a lot more difficult as can be seen in my videos, there were quite a few aggressive fights. However, I persevered and it worked out. The only reason I went with 2 females that time was because I adopted an already bonded M/F pair to live with Primrose. I lost Reuben last year so only have a F/M pair atm which is Primrose and Bertie but if I were to get another in the future it would 100% be a male. Last edited by Mischief and Tinker's Mum; 16-04-2018 at 10:01 PM. 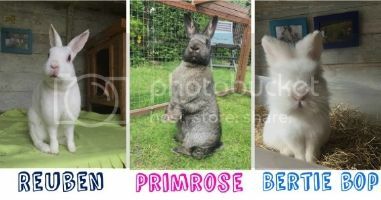 Mummy to Primrose and REW boys Reuben and Bertie! I have to admit I really want a trio. The main reason for me is that it would mean my bunnies would never be without a companion. In a pair, when one sadly passes away, the remaining bun would be on their own until I can get them another friend which can sometimes take time. So far I haven't been brave enough to take the plunge because of fears of breaking up the existing bond my current pair have. However I think Tulsi makes a good point about the seasons. So I'm going to ponder it some more over the next few months. If I were to go for a trio bond Autumn/Winter might be the best time. I'd go for a MMF trio. I know what you mean about the value of having a trio as opposed to just a pair. I bonded a trio last year, and idiot that I am chose the spring to do it! Having said that, because of bunny bereavement I didn't have a lot of choice. I'm also going to be doing it in spring lol.. I can't wait any longer though because the bedroom that fleur is in vets really hot in summer and I want her to have the option to come downstairs and into the garden when she wants. I've made a little door for the Buns in my living room door and I have to keep it locked now indeed fleur gets out of the bedroom and comes downstairs. And plus bleu goes upstairs and torments her by scratching on the door. I feel like I have to spend half the day in my bedroom so she is not lonely. I keep watching your videos to boost my confidence. My fleur behaves just like your primrose lol... I fell for little Reuben too, he liked to pick eyes just like my girl buttons. So sorry you lost him. What actually counts as spring? For spring fever I mean? I’m likely to be doing it end of June-ish (if the buns I get later are already neutered/ spayed, otherwise it might be autumn! ), am I safe then??! !